Jal Mahal Jaipur is the famous historic palace situated in the Man Sagar lake of Jaipur, the capital of Rajasthan (India). It is also known as “Romantic Palace” or “Water Palace”. This castle situated in the womb of the Aravalli hills is also called ‘Eye Ball’ due to the middle of the lake. This palace built by Maharaja Jai Singh II. Jal Mahal is now also evolving in the form of the bird sanctuary. The nursery here has more than 1 lakh trees, where the tallest trees of Rajasthan are found. 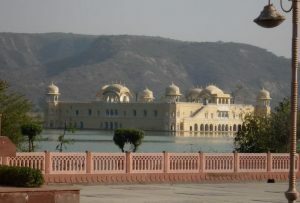 This water palace is situated in the middle of Man Sagar lake on Jaipur-Amer road. This palace was built in 1799 by Sawai Jai Singh II for bathing with his queens and pundits after Ashwamedh Yagna. Prior to the construction of this palace, Jai Singh reconstructed a dam on the Darbhawati river for the water supply of Jaipur and constructed the Man Sagar Lake. The king used to use this palace to spend a quality time with his queen. He used it on majestic festivals too. In the time of 1596 AD, there was a famine of water in this region. Then the ruler of Aamer decided to make a dam so that he could collect the wasting water. According to the plan, the dam was constructed and water was collected from Amer mountain and Amagad mountain. This dam was made of stone in 17th Century. And today this dam is about 300 meters (980 feet) long and 28.5-34.5 meters (94-113 feet) deep. An internal 3 gate has also been constructed to shed water. So that water can be transferred to the farm when necessary. Since then, this dam has become quite famous in the local people and after this, the ruler has also repaired it from time to time in Rajasthan, and it was rebuilt by Amber King Jai Singh II in the 18th Century. This palace is present in the midst of a deserted desert. But you do not feel hot here. Because many of its floors are made inside the water. The beautiful view of the mountain and lake can also be seen from this palace. The palace looks very attractive in lake water during the moonlight night. This place is now developing as a bird sanctuary. Government employed 40 gardeners to maintain this sanctuary. This nursery is the tallest nursery in Rajasthan. There are thousands of variations of Aravali plant, ornamental plant, and many others. Many of 150 years old trees have been transplanted here and given new life. Every year, plants like a Date palm, China palm, and Bunganbelia are transplanted.You can see different and beautiful birds on this lake. The most attractive thing of the Jal Mahal is itself Lake. The garbage deposited in the lake is shed from the bottom. Nearly 2 tons of toxic is shed every year. The water system has also been developed to keep the reservoir pure. The Rajasthan state government declared this place as a protected area. So nowadays Entry not allowed in Jal Mahal Of Jaipur. A few years ago, tourist can reach this palace using a boat ride. But now all the services have been stopped. There is no entry fee required here. You can click some awesome pictures without spending any money. Tourist can take a camel ride near this palace and it costs you around Rs.150 per person. There are no limitations on timings but we suggest you to visit this place in the evening and during moonlight night. In the evening place is very much crowded. 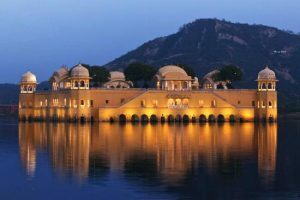 Best Time To Visit Jal Mahal Jaipur? Best time to visit here is from October-March. As this is desert area avoid visiting in summers. During the winter season, you will get most pleasant and comfortable weather. Plan your trip according to moonlight night. So you can experience the most romantic moments at this romantic palace. Jal Mahal is at the distance of 5 Kms from this Palace. By Road: There is good availability of public transport in Jaipur. Nearest bus stop is Shahpura Bagh and it is located around 200 meters from water palace. As a metro city, private transports like Uber & OLA are also available here. By Train: Nearest railway station is Jaipur junction. It is located around 12 Kms from this castle. Chandpole metro station is the nearest metro railway station from this palace. By Air: The nearest airport is Jaipur. It is around 24.5 Kms from this palace. Jaipur is connected with big international & national cities. Hawa Mahal: Identity of Jaipur also known as “Palace of Winds” located at the distance of 7.3 Kms from here. Jantar Mantar: One of the oldest observatory present in India built at the distance of 7.5 Kms from the “Romantic Palace”. Amber Fort: Popular movie shooting spot is available around 6.3 Km’s from Jal Mahal Of Jaipur.